On Monday, Murfreesboro residents gathered to celebrate the opening of the Law Office of W. Scott Kimberly, which opened its doors earlier this year. Local attorney Scott Kimberly discussed his vision for the future of the office with those in attendance. Kimberly has practiced law on the Murfreesboro Public Square for several years, recently leaving a partnership to open his own office. 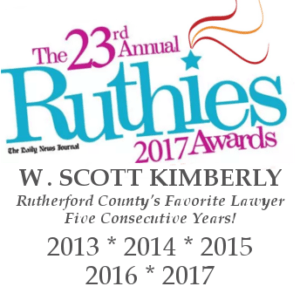 Kimberly is involved in various organizations and associations throughout Rutherford County, including the Rutherford County Chamber of Commerce, Murfreesboro Young Professionals, and the Rutherford Cannon County Bar Association. In recent months, Kimberly lectured at Middle Tennessee State University about constitutional rights and police interaction. Kimberly also recently spoke at the Rutherford County Chamber of Commerce on the topic of professional development. The Law Office of W. Scott Kimberly is located in the Historic 107 North Maple Street Building on the Murfreesboro Public Square. For more information, call 615-890-1099 or visit murfreesborolawyer.com. Unfortunately, kids are often collateral damage in a divorce. Divorcing parents are concerned with how often they will see their children. However, they are also concerned with the financial result of divorce. Under the child support guidelines, the number of days spent with the kids directly impacts the child support award to be paid, which leads to an uncomfortable situation where both parents are fighting for more time with the kids and neither parent’s motive is clear. When you throw in the emotional impact of divorce, and the fact that each parent may be fueled to gain an upper hand on the other in the divorce, the fight over the kids can become poisonous. The most important step towards making sure that both parents can afford to have quality experiences with the kids after divorce is to fight for every cent of financial support. This includes both spousal support, which is sometimes called alimony, and child support. In a situation where the Father is the high income earner, but the Mother has more time with the kids, the Father may want to be the “fun parent,” who takes his children on weekend trips and theme park vacations. The Mother may feel forced into being the “serious parent,” who handles the weekday responsibilities of housework, homework, and school events. Naturally, the lower income parent in this situation is going to feel limited in the ability to have quality experiences with the kids. The primary check against a high income parent using a lot of money to have more quality experiences with the children than the low income parent is the court, who will award the low income parent a certain portion of the high income parent’s income to provide for the children. The lower income parent needs to make sure that the court knows the income and earning potential of the higher income parent. If the higher income parent’s income is accurate, then the lower income parent should receive some kind of financial assistance, which will allow both parents to have quality experiences with the kids. Tina Orem with Credit Card Guide wrote an article that provides Seven Steps to Avoid Revenge Debt During Divorce. I was fortunate enough to chat with Ms. Orem and be quoted in the article. In Murfreesboro, Divorce is often contested. When one spouse decides to end a marriage, he or she will file for divorce in Rutherford County, but what happens to the marital money during the divorce? Often, people find themselves in a situation where a divorce action has been filed but they are technically still married. This may lead to a problem that some call revenge debt. Revenge debt, in the divorce world, is the term used to describe a situation where one spouse takes out debt in the other spouse’s name in retaliation for filing for divorce or for other behavior. Unfortunately, since the parties are still legally married, one spouse may be able to do that. If you are contemplating divorce, or have filed for divorce, what are some practical steps you can take to prevent what some call revenge debt? In short, the best advice can be boiled down to two points: be proactive and be preemptive. However, Ms. Orem interviewed several lawyers in the article, from all across the country, and put together the best advice and tips. Give it a read! Several of these principles apply in Tennessee Divorce. However, every case is different. If you are facing divorce in Murfreesboro or Rutherford County and are worried about your spouse taking out revenge debt against you, give me a call and we can discuss your options and how you can protect yourself from revenge debt.